I was born in the Year of the Tiger. Tigers are cool, yo. None of that namby-pamby Rabbit or dour-faced Ox stuff. But of course, in the grand scheme of Chinese patriarchy, Tiger daughters are disdained. Tiger women are supposed to be fierce, aggressive. One of my aunts was nearly given away because she was born in the Year of the Tiger. In his Chinese New Year message this year, Singapore Prime Minister Lee Hsien Loong saw fit to remind Chinese Singaporean couples that "children born in the Year of the Tiger [...] are really no different from children born under other animal signs." I can't believe some people still need that reminder. I also can't believe (okay, yes I can, but I still wish he didn't say it) that the Prime Minister --- whose wife is the CEO of the government's leading investment company and whose deceased first wife was a doctor --- ditched a teachable moment (TM Barack Obama) about sexism for yet another expropriation of women's fertility for the PAP government's idea of national good. I wish tigers were not rapidly approaching extinction. I wish people would be nicer to animals. This is only the third time in my life that I can remember the Year of the Tiger coming by, so pardon me if I get a little proprietary over it. I like being a Tiger. I look at my cats and I think, ah, they would be great tigers. Ink would preside majestically over some jungle, while Sisu would dart around more cautiously, occasionally sinking her teeth into your hand when you thought she was tame enough for you to pet her. 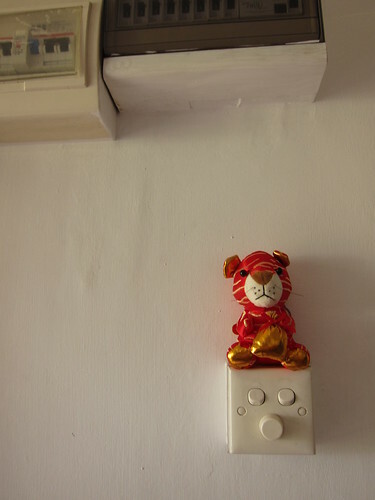 The last time the Year of the Tiger swung around, I did not have any cats (nor any blog). I was also ... well, let's just say I was in a different place, then. What's strange to think about is that I'm probably about halfway through my life now. I'm not about to get morbid (or maudlin, for that matter), but these 12-year cycles are certainly a different way of reckoning things. Since I've gone freelance, I've often felt like every year has to have something, to mean something. The museum project, the book, Vietnam, Korea --- what's this year's thing then? All the more (and I realise this isn't exactly a rational urge) because this year is my year. My friend Cheryl is writing a book called A Tiger in the Kitchen. She's a Tiger too, so it's a clever title. I'm not quite a Tiger who cooks, but it's not like I've spent my life deliberately throwing myself against stereotypes either. I'm just not very good with the cooking, no matter how hard I try. I much prefer to just eat. Is that Tiger-like? So it's the Year of the Tiger, and here I am. And unbelievable that PM said that. What in blazes? happy new year, ms tiger! hope lots of good eats come your way. I paid how much for SMSes?